Capable of reaching a height of nearly three feet tall, this gentle giant of summer is among the largest members of the Lily Family. 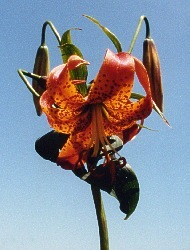 With recurved petals colored yellow to orange and bearing reddish-brown spots, this flower can be identified from some distance away, growing on moist roadsides and meadows. Up to 40 flowers have been counted on just one plant of L. superbum, while a similar but smaller species, L. michauxii bears only 1 to 6 flowers per plant. Blooming time for both species begins in July and runs through September. This plant possesses no significant medicinal properties, although early American Indians used the bulbs in soups.